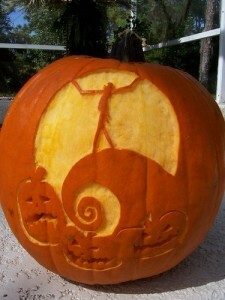 Readers and bloggers all over the internet are beginning their October countdowns to Halloween. So I wanted to join in the fun as well. Throughout the month of October, I'll be writing about everyone's favorite scary, monstrous or spooky Christmas entertainments. Before you start wondering just how many Christmas episodes, specials or movies there could possibly be that are October appropriate, let me remind you that Charles Dickens' book A Christmas Carol is a ghost story with four spirits visiting Scrooge in one night! 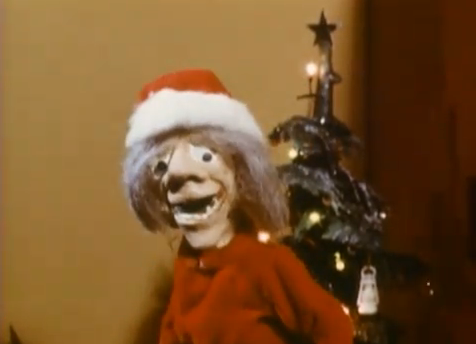 In my book, The Christmas TV Companion, I have an entire chapter dedicated to Christmas horror stories. But there are many, many more frightening and scary Christmas stories we watch every year. If you have a particular Christmas-themed television episode, special or movie that you'd like to see me cover, then comment below and I'll see what I can do. 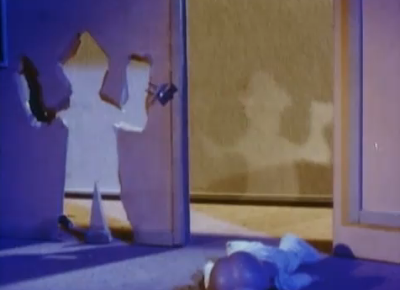 Today, I'd like to discuss a stop-motion animated segment from the Gumby TV series. 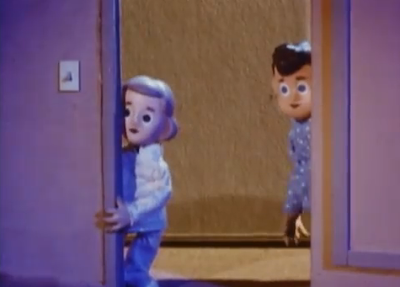 In this early 1960s Gumby Adventure short, Gumby's friend Pokey stars in his own Christmas story. On a journey to Santa City, the horse, Pokey, discovers that Santa Claus is sick. Pokey suggests his friend Witch could deliver the toys rather than cancelling Christmas altogether. On her broomstick, Witch arrives in Santa City. She uses Santa’s sleigh to travel the world with two companions: Pokey and his friend Sybil the seal. When she finds a home without a chimney, Witch uses her own magic to enter people’s homes. 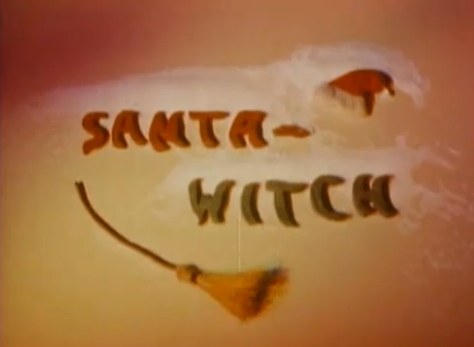 Unfortunately, Witch frightens a brother and a sister expecting to surprise Santa! These Davey & Goliath look-alike kids are trying to surprise Santa! SURPRISE! the sister drops face down and the brother breaks through the wall running from the scary Santa Witch! Pokey's solution to help Witch from frightening more children is to give her a creepy plastic Santa face mask to wear!? Merry Halloween. 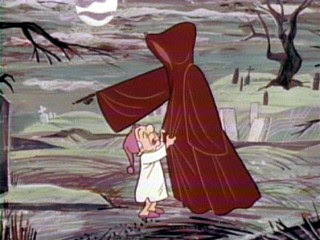 In the scene where Witch frightens the children, can you see the inspiration for Tim Burton’s The Nightmare Before Christmas? This scene reminds me of the unexpected responses from children when Jack Skellington, acting as Santa Claus, surprises children with spooky gifts made in Halloween Town. 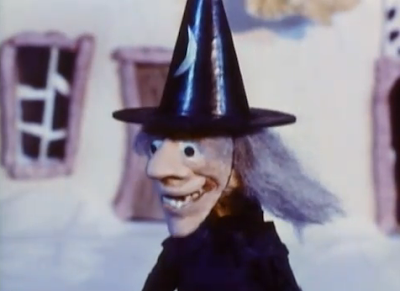 Check out the links below to see what else I've previously written about Art Clokey and Gumby. I really do not remember this episode! Seems really wacky! And can't wait for your Halloween-y posts, too! Wow, I've never seen this episode of Gumby, and I immediately thought of Nightmare Before Christmas. Thanks for pointing to this!